By assuming that 1 pound of body fat has about 3,500 calories, and assuming all else remains equal, the daily calorie reductions would translate into an average reduction of 3.8 pounds over a year for adults and 4.5 pounds over a year for children. Not so fast, I say. Even assuming that all the assumptions in the report are correct, all it does is show that our net calorie intake from beverages would, on average, go down. But if you switch to diet soda, it’s pretty likely that you’ll just make up the calories somewhere else. In fact, if this study is correct, it’s possible that you might increase your total calorie intake. 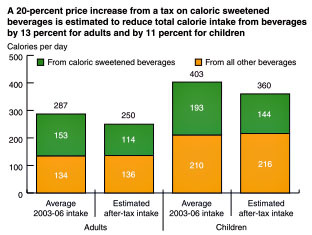 I’d actually be interested in some large state imposing a tax like this purely for research purposes, and since I don’t drink sugared soda I’d be happy to nominate California. We need the money anyway. But my guess is that the results would disappointing. People might end up swilling less high-fructose corn syrup, but they’d probably just eat more corn nuts to make up for it.